Here’s a selection of my work so far. In focus is my contribution to Kung Fury, followed by my work on Crazy Pictures Vaskduellen, Arthur & Merlin and El Scorpio Games introduction video. A variety of my models throughout the years. A mix of simulations for Vaskduellen, real time for UE4, hard surface for BlåFilm, organic creatures, characters and some rigging. By request, people have been wanting a summary of different cartoon and motion graphic animations I’ve done, outside the realm of visual effects. Well, here goes. It’s a mix of architectural visualizations, motion graphics and animated shortfilms. The buildings and motion graphics are for clients such as USSED, North Kingdom and Linnea Produktion. The animated clips are from my own personal projects, of which are also available in full on this site. I had the pleasure of making an introductory video for the newly established horror game company, El Scorpio Games. Theme: Amusing Horror. Zbrush for hi-poly, Topogun for retopo, UVLayout for UV-map, Maya for animation and rendering using Mental Ray and compositing in Nuke. Logo by Martin Runnzell of El Scorpio Games and music by Mikael Ericson of Jaded Produktions. This is also an early assignment during my time at Luleå University of Technology and gscept. A combination of platform puzzle and top-down shooter. We were made up of a team of two artists and two developers, and I contributed with both environment textures, character animations and visual effects, as well as alien ship design, together with Mariusz Waclawek who created the interactable assets and background tiles. As a game engine, Scirra Construct was used. The project time was roughly 8 weeks, though developed simultaneously with other assignments. It’s very hard, just like the games of old, so don’t blame me if your keyboard suddenly brakes for reasons unknown. Gscept offers education in visual effects, game design, prop and set design. One of its courses is a hands on experience in game creation, where CG-artists and developers team up for 6 weeks in order to create a fully functional game to compete with in the Swedish Game Awards. This is our result: Lunarena. An arena based third person shooter in the Edwardian era, taking place inside the moon. The game art was inspired by Georges Mèliés A Trip To The Moon, with a bit of steam punk twist added to it. We consisted of a team of 26 cg-artists and developers, using SCRUM as a method of development. My contribution was both as a concept artist for the player characters, 3D-modeler (creating A LOT of rocks and retopologizing hi-poly game assets), texture artists (both organic and metal) and animator (alienesque plants and player characters). I also did the music for the trailer. We used Nebula3 as game engine, where developers had the opportunity to create proprietary tools and custom physics. Even though we were not nominated in the end, it was a great learning experience, coordinating a big team, learning to focus on what is important at each stage in a production, and learning the hard way what happens when you get too over-ambitious (ie. not getting nominated). The game is no longer available for download, but the trailer is still available on youtube. It was made by a small team of CG-artist (including me), using the game assets. USSED is a think tank collective, interested in innovative building designs using recycable materials. I had the pleasure of creating a small visualisation for one of their presentations, an art gallery where cargo containers is the foundation, and where our obsession over “fika” and sauna is combined. I had the exciting opportunity to work on the trailer for the upcoming movie Kung Fury by Laser Unicorns. Apart from several 3D-models that will be used later in the production, I was put to the task of creating the VFX for the scene where Thor lands in a lake. A challenging shot and nothing I really had done before, but that’s why it was all the better as well. I’ve created a small breakdown with my contribution. Final grade and finish was made by David Sandberg himself. I would also like to thank David for awesome supervision. Here’s the fruit of my labour from Luleå University of Technology and the following year after. Included are my latest models for the upcoming Dead Man Zand game, 3D-animated Non-Stops for Linnea Produktion and also my old work, such as Garth the Gargoyle, Ellen Page, VFX and compositing-excercises and clips from the shortfilm Surprise and Childroom. In this project we were to implement and combine several visual effects techniques, ranging from matchmoving, 3D-rendering, dynamic simulations, compositing, set extensions and post-production treatment. Maya, PF-Track and Nuke was used. The Childroom is one of the typical assignments that gscept are known for. It’s intended to sum up all the typical basic functions in 3D-animation. This is my childroom, which takes place in a fictive diesel-punk environment. Here’s my specialization project for gscept GradShow 2012. I’m responsible for everything in the project, where I wanted to learn more of the process in implementing a CG-character in live footage. I created the rig manually for the gargoyle and it’s got a limited muscle system for proper deformation and jiggle effect. I used mainly Maya, Zbrush and Nuke. Big thanks goes to Mattias Bergbom for VFX-consulting and Erik Öhman for awesome acting and camera assistance. Here’s my latest contribution for Mountainwheel Games upcoming game, Dead Man Zand, a classic adventure game with huge amount of dark humor. I’m responsible for the modeling and texturing of two of the characters. Original concept art courtesy of Mountainwheel Games. 2D and 3D animations for Linnea Produktion and her work for the DIK union. The logotype animation was animated and composited in Nuke and the non-stops were animated in Maya and also had some composit work made in Nuke as well. During July 2012, I had the fun opportunity to work with North Kingdom on Laika’s interactive site ParaNorman Stop-Motion Lab, promoting their new feature film ParaNorman. 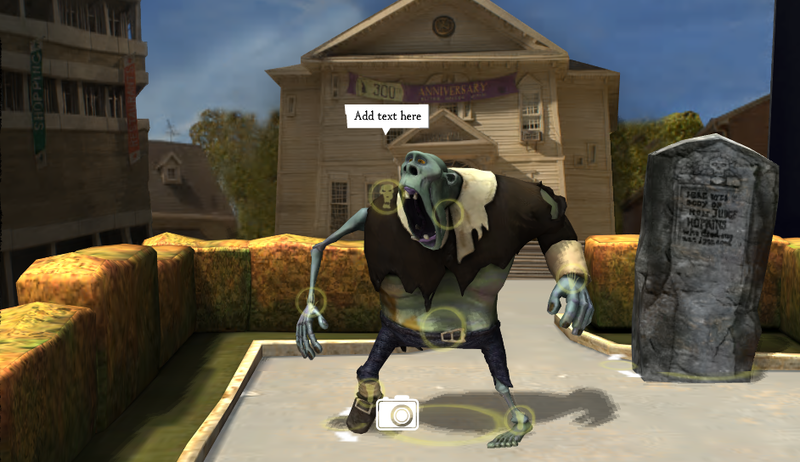 The idea was to setup an online animation tool, just like a stop motion scene, where the user was allowed to animate their own zombie and share the result on YouTube. My work consisted of modeling, remodeling, texturing and rigging work on most of the zombies, of which some already had the hi-poly version provided by Laika themselves. I also worked on some of the scenery with modeling, lighting and texture baking. The production was a fun challenge, and we had some great help from Frostware with the final tweaks in Unity 3D.